When you look at his 2017 stats to date, it seems ludicrous to even pinpoint second baseman An Chi-hong as a ticking time bomb in Kia Tigers’ season. The league leaders are without a recognised closer (Friday night in Suwon confirmed this), a reliable bullpen arm and possess two catchers who, despite showing promising early form, are struggling to make any impact in their primary role, or even as batters. Photo credit: Sports Seoul. 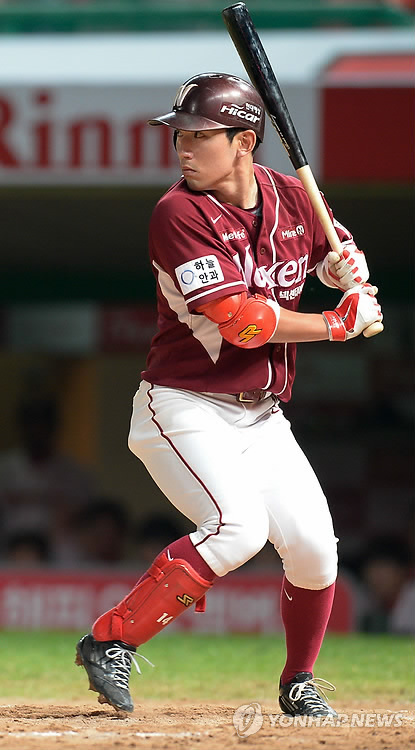 An Chi-hong at bat for Kia Tigers this season. These are An Chi-hong’s numbers before Wednesday night’s game against Nexen Heroes, thanks to Naver Sports. An’s 68 runs scored leaves him tied for 10th across the league. His OPS of .882 is just about good enough for top 20. These are promising enough. A very decent batting average and 13 home runs which put him on course to equal or better his career best of 18 in 2014. He also has a nice WAR of 2.53 and he was comfortably voted in as an All-Star last month, although, perhaps tellingly, his peers deemed Nexen’s Seo Geon-chang more worthy. These are how An compares to his rivals at the 3 other clubs** currently in the playoffs spots, starting with Nexen’s Seo Geon-chang. Seo has a very unusual batting routine but he’s one of the most hard-working and effective players in the league. A lot of the stats are very similar and both men have actually recorded the same number of doubles (22) and triples (2). Seo walks more (a lot more) and strikes out less. He’s a remarkably consistent baseball player. Next we have Doosan’s Choi Ju-hwan. Choi probably didn’t expect to be Doosan’s starting second baseman this season and it probably wouldn’t be a major surprise to see Oh Jae-won return to the side more regularly as the season progresses. Choi, nevertheless, is a good player but a level below An and Seo. NC Dinos’ second baseman Park Min-woo is a different sort of player to An, batting at the top of the order. **A comparison with LG Twins is difficult given the injuries they’ve suffered in their infield midfield this season. However, with everyone fit, they’ll probably line up with Son Ju-in and Oh Ji-hwan at second base and shortstop in the playoffs. How does An compare to teammates? .363/.471/.656 slash line (league best for OPS and third for batting average). Choi’s 6.28 WAR is second to Doosan slugger Kim Jae-hwan. His 95 RBIS are also a league best, and home runs stand at 24. Roger Bernadina: .322 average and a .946 OPS. 21 home runs, 77 RBIS and 4.50 WAR. Ranked first for runs scored and 3rd for stolen bases. Kim Ju-chan: Kim’s turn around in form has been exceptional and, like much of the last 4 years, is a very important player for Kia. His average has finally gone above .300 after months toiling in the high .190s. He has 49 RBIS and an OPS of .835. Given how his season started after surgery in winter, Kim’s comeback is one of the bright spots of an already great season. Na Ji-wan: Na began 2017 with a grand slam but be hasn’t always hit those heights. In fact, too often, he’s miles off. The President of the World is the Tigers’ most streaky player; there are very few in the league like him who fluctuate so rapidly. Still, the DH has a .312/.412/.536 slash for 2017, with 17 home runs, 70 RBIS and a 3.34 WAR. Lee Beom-ho: Another player who missed most of the early weeks through injury, Lee hasn’t quite reached the quality of yesteryear. It is hard to know if time has caught up with him, or injuries are still a factor. Still, the third baseman is having a decent season batting number 7, blasting 17 home runs and bringing home 57 runs. So why are we talking about An Chi-hong? The problem is, batting 5th in an exceptional offensive unit, An has stopped bringing men home and seems to be the classic no-out solo home run guy, who is too often the last man out when men are in scoring position. I’ve thought about writing this piece for a couple of weeks now, but after Tuesday’s 5-3 loss, I felt compelled. Photo credit: Yonhap News. Nexen’s Seo Geon-chang is a workhorse, who never seems to have a bad day. He plays as hard on a Tuesday night in early April against kt as he would in late September against Doosan. His batting routine is pretty strange, though. The Tigers recorded more hits (13-12) on Tuesday with an equal number of walks but lost by 2 runs. An went 1 for 4, with one run scored, but this is a break down of how he fared in each inning. 1st inning: 2 men on, 2 outs. An ends the inning with a pop out to shortstop. 4th inning: 0 on, 1 out. Single to center field. Scores a run. 5th inning: 1 on, 2 out. Flies out to left field on the first pitch to end the inning. 7th inning: 2 on, 2 out. Tigers are back to 5-3. An strikes out to end the inning. Since the first day of July, An has recorded 11 RBIS. However, 4 of those came in one game. This is over 22 games and 85 at bats, before Wednesday’s game. In only 6 of those games, the second baseman managed more than one hit (never more than 2), whilst collecting 3 home runs. He recorded 14, 17 and 19 RBIS in April, May and June respectively, but that number dropped to just 8 in July. His batting average slumped to .281 from mid 300s and was at .208 in August before he was benched (that’s coming up later). An is hitting .317 with runners in scoring position (league 30th), and has 11 defensive errors against his name. Kia shortstop Kim Sun-bin, leading the league for batting average, is hitting .465 with teammates in scoring position. He also has 4 fewer errors. On Wednesday, An went 1-3 with an RBI and a run scored during a routine home win. His first at bat, in the first inning, again ended the inning with men on base and one in scoring position. It just feels like the norm these days. However, the Tigers, perhaps sensing he was either slowing down and in need of a rest or just not productive enough, announced he wouldn’t start Thursday’s game in Suwon versus kt wiz. Even though that game didn’t take place due to rain, Seo Dong-uk lined up at second on Friday. An Chi-hong is an immensely popular player in Gwangju, and it is easy to see why. He hit a home run in Game 7 of the 2009 Korean Series, as a rookie, at a time when the game, and the title, seemed to be slipping by. The Tigers went on to take the championship with a walk off homer by Na Ji-wan. His #8 uniform is one top the top 5 sellers at the club, up there with Kim Sun-bin, Yang Hyeon-jong and Yoon Suk-min. Perhaps he just needs a break to recharge his batteries. The Tigers need him back to his spring and early summer form soon.